The spectacular Arun River Gorges expedition is a trip for those interested in undertaking a remote expedition. The scenery on the trek and river journey is unrivalled and unspoiled. The Upper Arun is one of the most powerful and respected rivers in Nepal, cutting through the Himalaya with deep and awesome gorges, lush valleys and superb riverside beaches. The powerful current and big volume water ensures huge and impressive rapids are encountered throughout the length of this river journey. 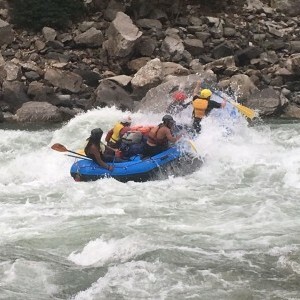 The rapids are challenging and technical with a high degree of difficulty. 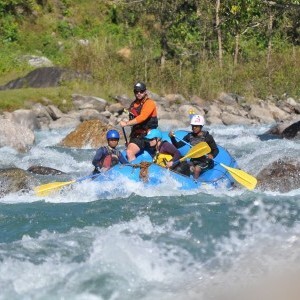 The first part of the river trip consists of primo class 4-5 whitewater and is for adventure seekers. The Arun’s source is up on the Tibetan plateau and this river and its tributaries drain a huge watershed. The expedition descends through an idyllic setting consisting of granite canyons, overhanging jungle and many varieties of plant and animal life. Only a few expeditions have been down this river so far and it is the first choice for those wanting a true adventure expedition into the wilderness. In terms of topography it begins far north of Kathmandu in Tibet and swings in an easterly direction for around two hundred kilometres, draining the northern slopes of Everest and Makalu before cutting south through the Himalayas and into Nepal, it carves through the Himalayas providing some of the deepest and most impressive gorges that have fascinated explorers, travellers and river runners. 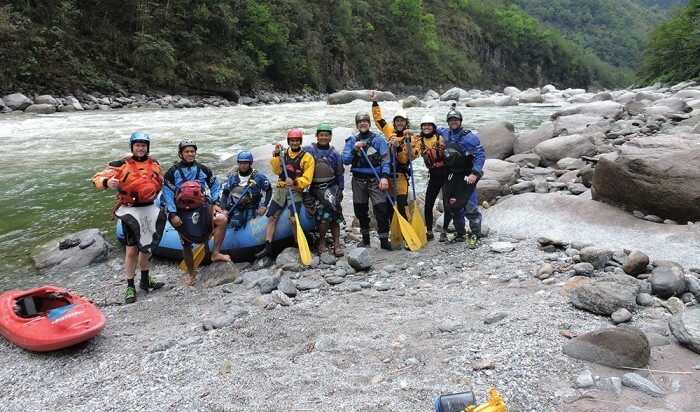 The journey to the put-in point for the rafting and kayaking on the Upper Gorges of the Arun River involves a 16-hour road trip from the nation’s capital, Kathmandu with transportation arranged by Adventure Hub Nepal. You will travel to Tumlingter or Bumlingtar by private bus. From here we will start our three day or four-day trek to our put in point which will be below Num village or the Apsuwa Khola tributary. We will paddle approximately fifty kilometres which will take three or four days of action packed rapids graded three to five with a few portages as well. Then the crew will be joined by the rest of the group to paddle the lower Arun from Tumlingtar. From here we load up our gear boat with delicious fresh food for the next four or five days’ river journey of mostly grade 2 to 4 rapids. This section comprises of fun, bouncy white water where you can relax a bit and enjoy the spectacular scenery with your fellow paddlers. Paddle down into the Sun Kosi River and onto Chatra, the take-out point of Arun and Sun Kosi. If you don’t want to do the overnight bus trip from here back to Kathmandu (approximately 18 hours) it is also possible to arrange a flight from Biratnagar. This is a 1hour road journey from Chatra, and this flight takes around 35 minutes to Kathmandu and this will be an additional cost. 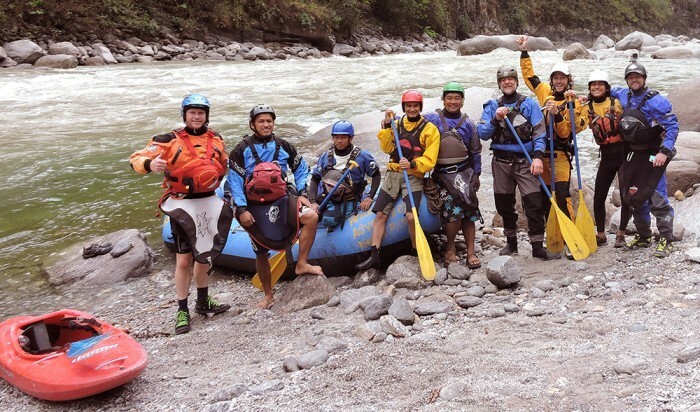 Arun River Expedition: Adventure Hub Nepal organizes all the logistics for the expedition; transport, food, permits, guides and the trekking, rafting and kayaking sections in the Arun valley. Ram ( Co-Director of Adventure Hub Nepal ) has been on the Arun Gorges before many years back with a Russian crew with kayaks and a bublick. 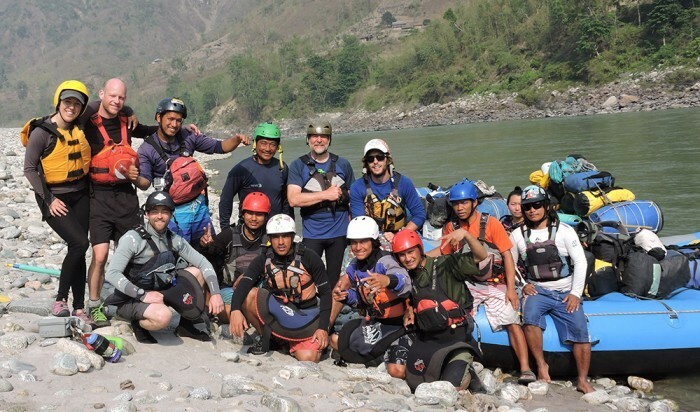 Ram revisited this spectacular place when Adventure Hub Nepal organised and succeeded in a great expedition in 2015 which was a first decent rafting trip with crew from United Kingdom, Canada, France and Nepal. We managed to run 80% percent of the river on our 16ft raft with well organised safety and well experienced team members. If you ever wanted to do this trip then this is for you, experience of class 4 and 5 raft guiding is preferable but not essential. The lower section can be paddled with people of all types of experience. The plan is to put in at the Apsuwa Khola River (tributary). Keep in mind that this section has been rafted very few times so we will be taking our time on the bigger rapids and from Ram’s memory from his previous expedition there are a couple of long portages in this section. Otherwise it is primo whitewater which is loads of fun! We will have space for six rafters (must be experienced) and four kayakers. 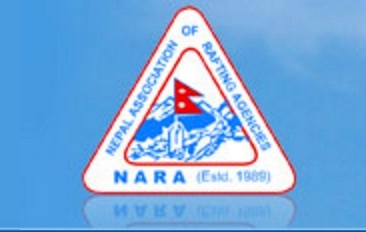 On top of this there will be three Adventure Hub Nepal staff which will make the maximum trip number at thirteen people. The kayakers must be experienced on grade four and five whitewater. The total length of the trip will be 116 kilometres. Extra snacks while doing activities and meals in Kathmandu. Travel Insurance which is you need comprehensive one with helicopter rescue cover. Any optional tours or activities during the free time. Meals not listed on day to day itinerary. Personal small first aid kit. Emergency evacuation and rescue cost if need be. Adventure Hub Nepal staff will pick you from the airport and take you to your hotel. 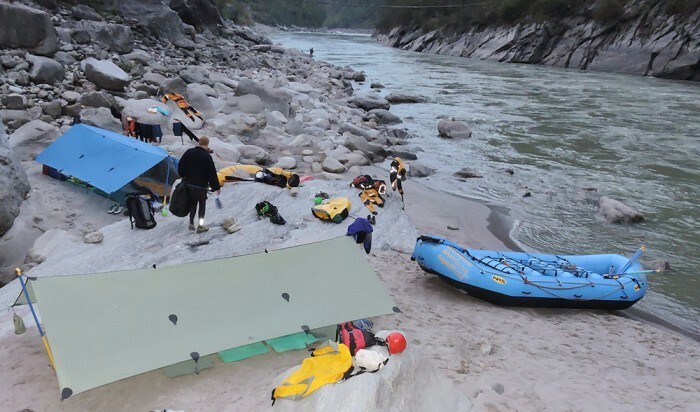 Relax and recover from the journey and then start to get your gear organized for next day’s paddling for the trip to the Upper Bhote Kosi River. Overnight in hotel in Kathmandu. Have breakfast and then it is a ten-minute walk from your hotel to the bus station where we will drive approximately 3 hrs up to the put in of the Upper Bhote Kosi River. The river this time of year will be medium volume grade 3 and 4. We will go for one day practice paddle with the crew so we can get to know each other in the raft and build up our communication skills between each other and the rafts, kayaks and how we plan to safely travel down the river together. Head back to Kathmandu and overnight in hotel in Kathmandu. Fly to Tumlingtar. Walk to Kattiheghat. Have breakfast and drive to airport for flight to Tumlingtar flight time will be approximately 45 minutes. We may walk a half day from Tumlingtar to Kattiheghat that afternoon. We will see how the group is feeling. Camp. Trek from Bumlingatar to Phukuwa and camp. An early wake up and have a quick breakfast and walk from Phukuwa to Apsuwa Khola which should be approximately a couple hours walk. Camp at the put in. Get all the gear and equipment organised, load up the paddle rafts and have final discussions on river communications between the group, safe river running, setting safety and any other concerns or issues brought up by any group member. 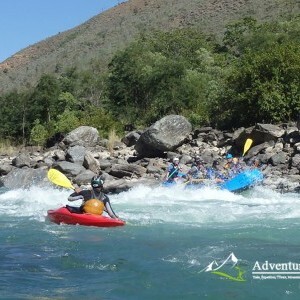 Kayak and Raft down from Apsuwa to Yaphu on the amazing and mighty Arun Gorges enjoy the scenery and challenging rapids put by the Arun River to us. Camp. Paddle from Yaphu and camp at Bumlingtar. Paddle from Yaphu and camp at Bumlingtar. Early morning wake up and get prepared for a fantastic and long days paddling down amazing whitewater with impressive gorges and spectacular landscape. Camp. Paddling down from Bumlingtar to Tumlingtar. Have breakfast and get ready for another great day paddling down from Bumlingtar to Tumlingtar. Beautiful whitewater and do take the time to enjoy the scenery. We will meet the rest of our expedition crew at Tumlingtar and enjoy a few refreshments and yummy fresh food that will be waiting for us there. Camp. After a leisurely breakfast paddle down from Tumlingtar to Kewa Khola or Kewa Besi but this all depends on how we travel during the day. Today will be a great warm up day for the newest crew members and a pleasant change for the ‘old’ crew. This is the one flat water day which will give us some time to relax. Paddle from Kewabesi to Pikhuwa or Mugal depending on the day will determine how much distance we cover that day. Fun whitewater rapids. Camp. Paddle down from Pikhuwa or Muga to Tribeni which is the confluence of the Sun Kosi River and the Arun River. Have a celebration party on the beach to rejoice in successfully completing the Arun Gorges expedition! Camp. Paddle into the Sun Kosi River and down to our take-out point at Chatra. Paddle into the Sun Kosi River and down to our take-out point at Chatra. Have a delicious traditional Nepalese lunch of Dhal Bhat and no doubt some refreshments. From here there is the option to drive to Biratnager which is approximately a one hour drive and then fly back to Kathmandu which will take about 35 minutes. Or, drive on the overnight bus with the all the gear which usually takes sixteen to eighteen hours but is always a fun trip. If you fly you will get to Kathmandu the same day you finish on the water but if you drive you will get to Kathmandu the next morning. Spend the day relaxing and shopping in Kathmandu and that evening we will have a big dinner party with group. Overnight in hotel in Kathmandu. We recommend people to have this day as an extra day just in case we happen to get delayed on the expedition for some reason.